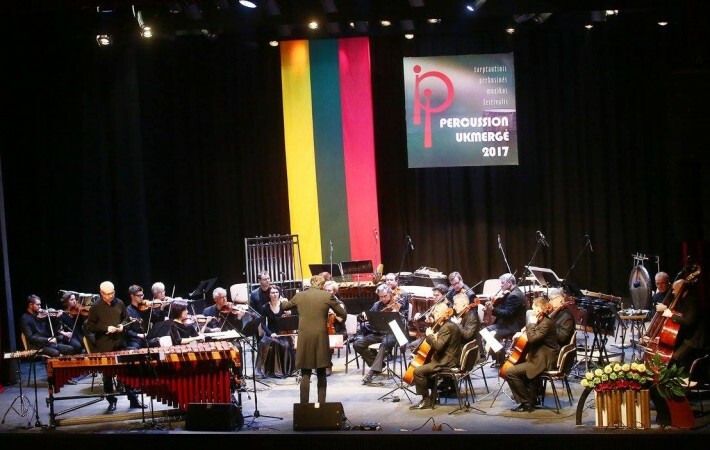 While mentioning Lithuanian Independence day in Ukmerge traditionally the percussion sounds played an important role in this action – there took place the international percussion festival “Percussion Ukmergė 2017. Celebrations began in the eve of the thirteenth percussion festival which lasted for three days. Music performers gave a lot of excitement and once again proved that percussion music is inexhaustible. On the first day of the festival ( 10th March) both parts of the concert were completely different. 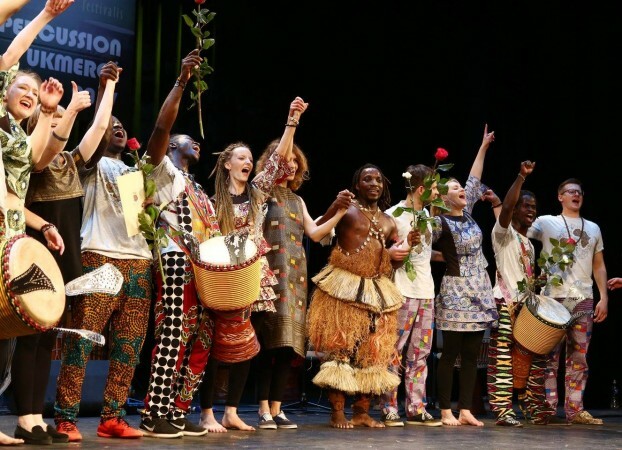 If the first part could plunge into meditation, the second part gave a strong gale of African culture to the audience. In the first part we saw participating Latvian performer Rihards Zalupe with his ensemble. His peaceful marimba and drums sounded harmoniously complemented by an electronic synthesizer sounds. Same, repetitive rhythm led the audience into reflections and meditation, but it was constantly interrupted by low sounds of the drums. In the second part audience met with exotic – unheard music, unfamiliar songs, unseen dances, African masks. 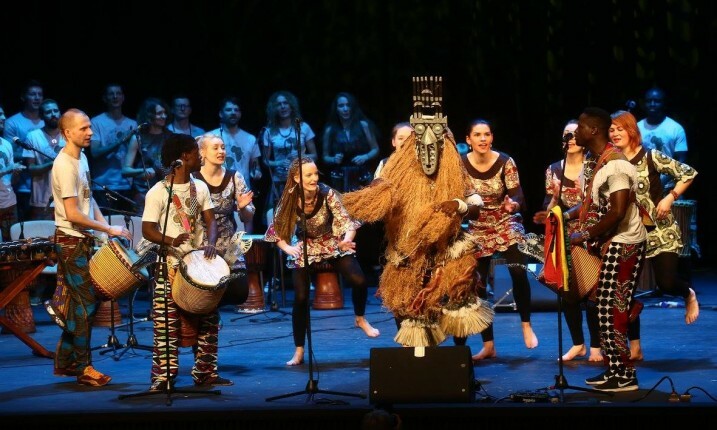 This performance was created by guests where participated a group from Guinea and Lithuania – percussion studio African studio of drums and dance “African dance”. Guests who came from a distant Guinea are known worldwide. 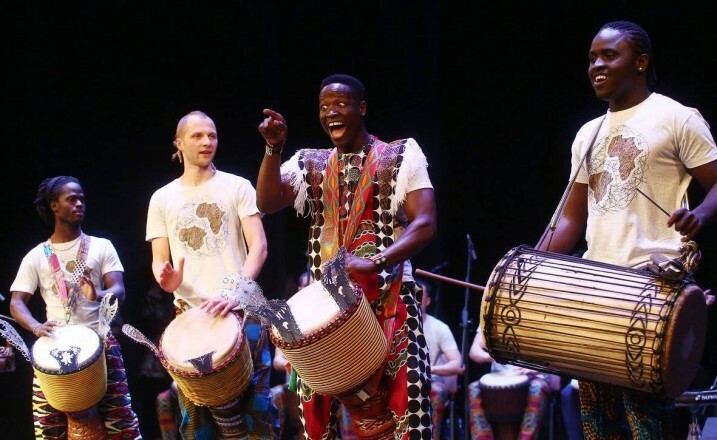 Percussionists Amara Toure and Bouba Toure appeared together with well-known traditional African drum djembe virtuoso Barbara Bangoura. Together with Lithuanians overheated hall here enslaved a dancer Seny Bangoura, who appeared with lot of different and colorful African masks. Dancer showed his masterpieces not only on the stage but also in the hall among the audience. During the commemoration of March 11th near the Monument of Freedom there appeared the students choir from the Art School Music department (hd. Giedre Karklelyte). This event was conducted by Augustinas Bjerkeland and Rugile Kliaugaite. The congregations were welcomed by the Major of Ukmerge region Rolandas Janickas and percussion music festival art director Edgars Saksons whose opening speech was pronounced in Lithuanian language. At the end of the celebration all were invited to form a tricolor “heart”. The evening festive concert began with the surprise – on the stage came and performed the head of this festival Edgars Saksons – the professor of Latvian Academy of Music, he performed the premiere “Meditacion” of Jonas Tamulionis. Instead of him there appeared one of the most famous virtuoso of percussion music in Europe Marta Klismara from Germany. Both percussionists played together with Lithuanian Chamber Orchestra conducted by Modestas Pitrenas. In the second part of the concert there sounded “Karmensiuita” performed by Radion Schedrin which was greeted by thunderous applause. The original music for this piece was created by Žorž Bize, but according to the request of ballet diva Maja Pliseckaja once it has been changed by Rodion Ščedrin and adapted to stringed and percussion instruments. 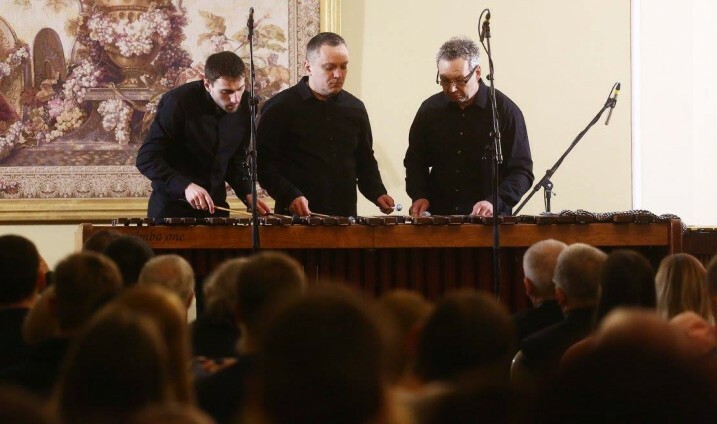 This composition was performed by Lithuanian Chamber Orchestra (conducted by Modestas Pitrėnas), percussion group of the festival – Edgars Saksons, Rihards Zalupe and “GiunterPercussion “- Pavel Giunter, Tomas Kulikauskas and Sigitas Gailius. On the last day of the festival, March 12th, the audience was invited to Taujėnai manor. In this friend-common concert we had the opportunity to see a lot of participants of this festival and a Swedish group “RhythmArtDuo” where plays Daniel Berg and Fredrik Duvling. To this festival they brought two worldwide known premieres to this festival. One of these premieres author is well-known Lithuanian compositor Loreta Narvilaite, while coming to a final concert of the festival she was listening to her composition for the first time. Here also playe the group “Giunter Percussion” (Marta Klimasara, RihardsZalupe). The full hall of the manor was very fascinated by charismatic Marta Klismara. One of her performances was acted without any instrument, just using her body. Swishing, snapping, and using her best vocal capabilities she proved that even a human body could turn to the best percussion instrument. The last concert was visited by Latvian ambassador in Lithuania Einaras Semanisa, as guests from Sweden embassy came there as well. Between all the guests there also was the embassy Attache for Defence liut. Örjan Ström. The tutor of the festival, honorary citizen of Ukmerge district, diplomat Vygaudas Ušackas appreciated the festival’s artistic director Edgars Saksons and the director of Ukmerge Cultural Center Rasa Graužinienė for the excellent organization. A Mayor of Ukmergė District Rolandas Janickas also expressed his gratitude for all the participants and sponsors of the festival. All concerts of this festival were held by musicologist Darius Užkuraitis. The festival was funded by the Ministry of Culture of the Republic of Lithuania, Lithuanian Cultural Council, the Municipality of Ukmerge district and private sponsors.